Abuja, Nigeria. 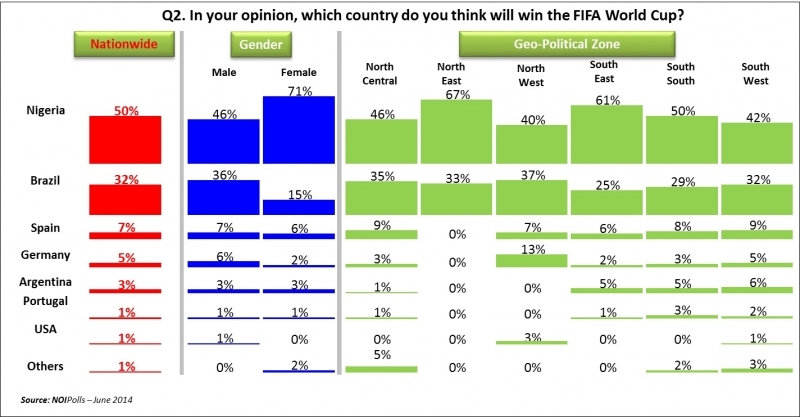 June 17th, 2014 - Latest FIFA World Cup 2014 poll results released by NOIPolls Limited have revealed high level of patriotism by Nigerians as the vast majority (87%) have expressed support the Super Eagles at the on-going 2014 FIFA World Cup in Brazil; while some others support countries like Brazil (18%)and Spain (9%). The poll further revealed that 38% of respondents believe the Super Eagles of Nigeria will proceed beyond the group stages, while another 24% believe that Nigeria and Ghana are the two African countries that will qualify to the second round. Also, when asked which country will win the World Cup, 50% of respondents think Nigeria will win, with more female (71%) than male (46%) respondent expressing support. This was followed by 32% who think Brazil will win. Moreover, when respondents were asked directly if they think Nigeria can win the World Cup; 57% think the Super Eagles can win the 2014 FIFA World Cup and the reasons include: “Players are good” (24%), “They are Nigerians” (22%) and “It is possible with God” (18%). On the other hand, 43% of the respondents think Nigeria cannot win the trophy this year; with reasons which include: “They are not prepared” (32%), “Lack of experience” (18%) and “Previous poor performance” (15%). These were some of the key findings from the FIFA World Cup 2014 Snap Poll conducted in the week ofJune 2nd 2014. The 2014 FIFA World Cup is here again, with so much excitement, and Nigeria is not left out in the frenzy, considering that it's our fifth appearance at the tournament. According to the latest FIFA ranking released in June 2014, Nigeria is currently ranked 44th in the world and hopes to use this tournament to improve its rankings. Nigeria has been placed in Group F alongside Argentina, Bosnia & Herzegovina and Iran and the Super Eagles head coach, Stephen Keshi, has expressed his team's readiness to keenly compete for the trophy. 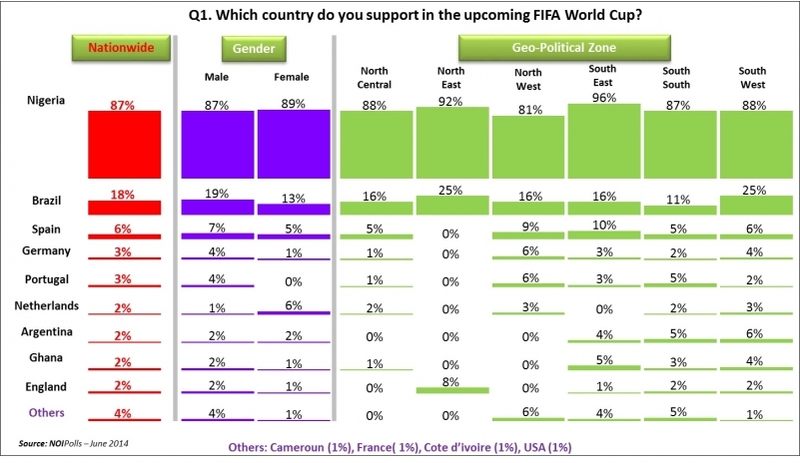 Against this background, for its Sports themed poll, NOIPolls conducted a poll on the 2014 FIFA World Cup tournament to measure the support of Nigerians for participating teams in the 2014 FIFA World Cup and the opinion of Nigerians about the Super Eagles of Nigeria winning the 2014 World Cup. Respondents to the poll were asked five specific questions. The first sought to measure the support of Nigerians for participating countries in the FIFA World Cup. Respondents were asked: Which country do you support in the upcoming FIFA World Cup? From the multiple responses provided, the results revealed that the overwhelming majority (87%) of respondents support the Super Eagles of Nigeria. This shows the high level of patriotism expressed by Nigerians, particularly when it comes to football. Nigeria is followed by Brazil and Spain with 18% and 9% support respectively. Analysis by geo-political zones revealed that the South-East zone (96%) had the highest proportion of respondents that indicated support for the Super Eagles; closely followed by the North-East zone with 92%. In addition, the North-East and the South-West zones have the highest number of respondents who support Brazil with 25% each while the South-East zone accounts for the highest proportion of respondents (10%) that support the Spanish team. In order to gauge the thoughts of Nigerians on the country that will win the tournament, respondents were asked:In your opinion, which country do you think will win the FIFA 2014 World Cup? Half of the respondents (50%) think the Nigeria will win the trophy; followed by 32% of the respondents think Brazil will win, while 7% think Spain will win the FIFA 2014 World Cup. Subsequently, respondents were asked: Which African country(ies) do you think will go past the group stages? The results reveal that 38% of respondents think the Super Eagles of Nigeria will go past the group stages, while another 24% think both Nigeria and Ghana will qualify from the group stages of the World Cup. In addition, 9% think Nigeria and Ivory Coast will progress, while 7% think Ghana alone will move to the knockout stage. 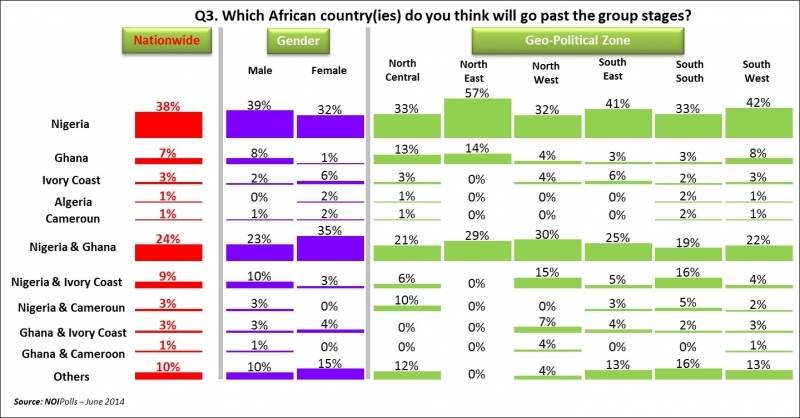 Analysis by the geo-political zone standpoint reveals that the North-East zone (57%) has the highest percentage of respondents who think Nigerian alone will go past the group stages. The North-West zone (30%) has the highest fraction of respondents who think both Nigeria and Ghana will advance while the South-South zone(16%) accounts for the largest proportion of respondents who think both Nigeria and Ivory Coast will go past the group stages. 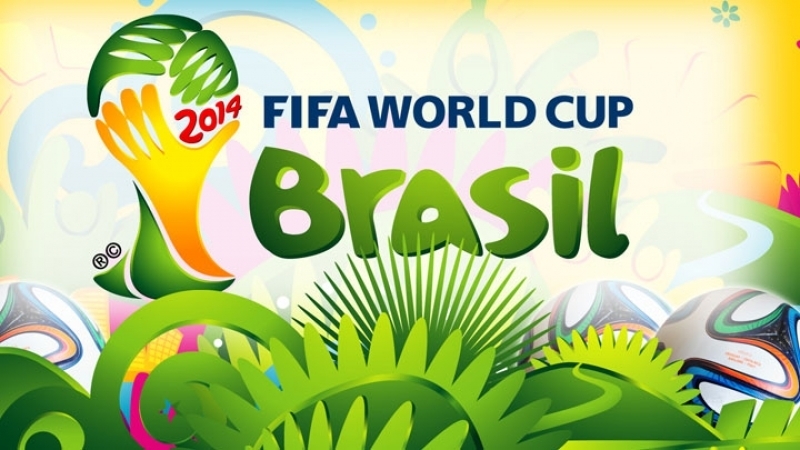 Subsequently, respondents were asked: Do you think Nigeria can win the 2014 FIFA World Cup? In response to the question, the slight majority (57%) think the Super Eagles of Nigeria can win the 2014 FIFA World Cup. On the other hand, 43% of respondents think Nigeria cannot win. The North- East zone (75%) has the highest proportions of respondents who think the Super Eagles can win the tournament, closely followed by the South-East zone with 70%. In addition, the North-West zone (56%)accounts for the highest number of respondents who think Nigeria cannot win the FIFA World Cup. Finally, to ascertain reasons for responses given to the previous question, respondents were asked: Why do you think Nigeria can or cannot win the 2014 FIFA World Cup? Respondents who think Nigeria can win the World Cup (57% of the total) gave reasons such as: “The players are good” (24%), “They are Nigerians” (22%), “It is possibly with God” (18%) and “Good team work” (14%). On the other hand, respondents who think the Nigeria cannot win the World Cup (43% of the total) gave reasons such as: “They are not really prepared” (32%), “Lack of experience” (18%), “Previous poor performance” (15%), “Nigeria does not have a team yet” (14%) and “FIFA manipulation” (12%). In conclusion, the poll results have shown once again highlighted the patriotism of Nigerians when it comes to football, as the vast majority (87%) support the Super Eagles at the on-going 2014 FIFA World Cup; although some others express support for Brazil (18%) and Spain (9%). Also, when respondents were asked directly if they think Nigeria can win the World Cup, 57% think the Super Eagles can win the 2014 FIFA World Cup for reasons such as: “Players are good” (24%), “They are Nigerians” (22%) and “It is possible with God” (18%). On the other hand, 43% of the respondents who think Nigeria cannot win the trophy simply gave reasons such as: “They are not prepared” (32%), “Lack of experience” (18%) and “Previous poor performance” (15%). Given these mixed views from Nigerians, it will be interesting to see how well the Super Eagles perform at the on-going 2014 FIFA World Cup tournament.